Hunting and fishing are funny in that sometimes things just don’t go the way you planned for them to go…then they do; it seems like the harder you try the less productive it becomes. Such was the case early on Saturday, May 4th as I left my home very early and pulled into my favorite Owen County farm in the dark. I was in hopes that it wouldn’t rain on me as I stepped out into the darkness across the half mile long hay meadow. On this day I would be hunting “commando” style…meaning I was going into the woods early and setting up less than a hundred yards from where I thought a group of birds would be roosted. I have taken birds this way before, especially gobblers that are ‘henned’ up…they will gobble and talk at you, but they are very unlikely to go looking for love when they have several hens already in their harem. As darkness finally started to lift and what seemed like every song bird in the country opened up…I eagerly awaited the morning’s first gobble. I slowly turned my head from side to side peering through the faint light, looking for one or many dark globs in the towering trees that surrounded me, but as hard as I tried, I couldn’t see any birds. Regardless, I was patient and knew that at any moment Mr. Tom would open up with his morning call. I waited and waited and as things go…7am rolled around and I had heard nothing, not a peep from anywhere. Now, I have turkey hunted most of my life and I know that on some days the woods are just going to be silent, I don’t know why, but I do know that this is how it is. I decided I would call, walk, listen and just enjoy the morning. I eased my way along, quietly calling with my box call and listening for anything that might signal an interested Tom turkey. I particularly like to stop and listen anytime geese or crows start their morning cry and as it turned out I was about half a mile from my starting point in the woods when I heard a group of crows open up…followed by a faint gobble. I quickly placed my box call in my vest and briskly walked towards the gobble…once I had gone what I thought would be halfway, I stopped and slid out my box call and gave one slow yelp; GOBBLE! This time it was much louder and no question as to the direction. Luckily I was on a nice path and I hustled ahead about another 100 yards and sat down against a tree with a valley below me where I could clearly see 100 yards in the direction of the bird. I pulled up my head net and got comfortable…slid out my slate call and quietly made a soft yelp, GOBBLE! This time the return call was very loud and I knew we were ‘engaged’…so to speak. I have learned through the years that less is more and waited about 30 seconds when once again GOBBLE! Quickly followed by another GOBBLE! This time I could feel the volume of the gobble and knew it was going to happen. Once more I made another yelp on my slate; this time even quieter than before-GOBBLE…followed by another GOBBLE and then there in the darkness of the woods was a white head moving directly towards me. Now…it is at this moment that it doesn’t matter how many times you have done this, or how many birds you have shot, this is what it is all about and your heart rate increases and even good hunters have to slow themselves down and control things. I eased my slate call to the side of my leg and slowly eased my shotgun up onto my knee. I knew that at this point this old bird knew exactly where I was and he didn’t need any further information. I watched as he head-bobbed his way towards me and as he crossed the small creek that was flowing with water, his beard dipped into the creek. There was no doubt that he was smitten and was on his way to do what Tom turkeys do! As he walked behind a big Gum tree I raised my gun into shooting position and in seconds there he stood, in full strut at about 25 yards. The display was another one of ‘those’ memories that I won’t soon forget; it was brilliant and there was just enough natural sunlight for me to see all the various shades and hues of his ‘coat of many colors’. I waited and he came out of strut, stepped towards me neck extended and I made one quick and lethal shot…I had just watched one of the greatest spring dances unfold before me and I knew I had been blessed by these past few minutes. 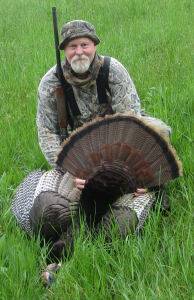 My bird weighed in at 20 pounds with an 11 inch beard and 27 mm spurs…and was in perfect condition; this meant that after many years and many birds I am having this bird mounted. I called up one of the best taxidermy guy’s around…Bill at Bill’s Taxidermy and asked if I should do anything with the bird? He told me to bring it to him and he would take it from there and later that afternoon that is exactly what I did…so, if you are looking for a guy who really knows his stuff, give Bill a call at 825-4204 and he will take care of your taxidermy needs. 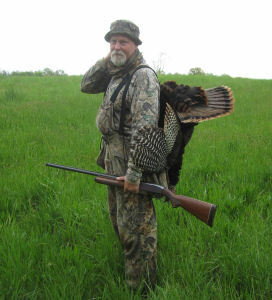 So while my day started out slowly, by just enjoying nature I was able to harvest a gorgeous bird and solidify a memory that will long stay there in the back of my mind; I hope that you will give turkey hunting a try and that you too….will have an opportunity to experience the greatest of all spring dances as we Enjoy the Great Outdoors.